Now in its 37th season, Pro Arte Chamber Orchestra played First Baptist Church in Newton for the first time, introducing many of us concertgoers to the august sanctuary equipped with surprisingly good acoustics. Russian-American Yevgeny Kutik bared a deep connection to Prokofiev’s Violin Concerto No. 2. Tchaikovsky’s always enjoyable Serenade for Strings stayed grounded much of the time under conductor Kevin Rhodes. Not far into the concert closer, the “Classical Symphony” of Prokofiev, Pro Arte began sparking, continuing to a convincing close. A receptive audience took up quite a few pews for Pro Arte’s “Russian Portraits” given Saturday night. While bitterly cold outside, it was altogether comfortable inside with warm welcomes from every usher encountered. Next, a cheery welcome came from two of the violinists, remembering Larry Hill, its founder, who had seized on the idea of a cooperative organization. A good number of committees plan the concerts and everything else that goes into that work. With the start of the 2010-2011 season, American conductor Kevin Rhodes became Conductor of the Pro Arte Chamber Orchestra of Boston. Two pages of program notes are devoted to his extensive experience from his 20 years-plus in musical capitals of Europe to a recent debut at Lincoln Center with the New York City Ballet. For some reason, the strings of the Pro Arte could not attain a finely phrased or dynamically structured statement of the Tchaikovsky Serenade. Where there were crescendos they did not evolve naturally. Downbeats hindered forward movement. Seated in the sixth pew facing the lower instruments, I heard far too much of the violins. Their higher, brighter sound was made still more apparent through an over-share of volume. The beauty of Tchaikovsky’s writing coupled with the Boston players’ essential grasp of the string score did, though, command attention. More noticeably, a melodic understanding as well as a timbre-nuanced gaze from the violas, cellos, and basses, would provide that layering we have come to expect in this richly scored and expressively composed piece for strings. Originally from Minsk, Belarus, Yevgeny Kutik immigrated to the United States at the age of five. 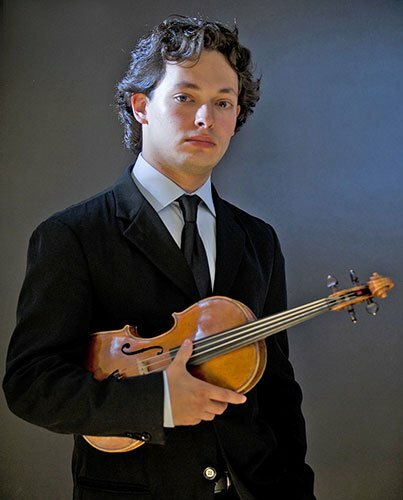 He began violin lessons with his mother, has studied with Roman Totenberg, and holds degrees from Boston University and the New England Conservatory. The young violinist’s list of performances also runs some two pages in the program notes. Every bit of love for the violin and the music emanated from Kutik’s 1915 Stefano Scarampella instrument especially considering the soloist’s native impulses for the 1935 Sergei Prokofiev. Kutik’s first Pro Arte appearance made completely obvious the orchestra’s encompassing welcome. And right away, when the notes of the opening G-minor melody issued forth as reflectively reminiscing, Kutik distanced himself from his generation of outspoken and aggressive violinists. This, in itself, is remarkable. Such simplicity reappeared in the first theme of the Andante assai with Kutik’s unfettered singing on the violin, a language of dignity and humility. Also fully in sight in Kutik’s playing is his admiration for the Prokofiev, whether it be a lyrical or virtuosic undertaking. In turn, the listener has to appreciate this youthful artistry, which resounds with honest dedication, rare amidst today’s breed. Accordingly, the Pro Arte reached heights in its supportive and complementary roles. Pro Arte remained alive in Symphony No. 1, Prokofiev’s take on another time, one that would please listeners as well as avoid being categorized as “formal,” a death knell in Stalin’s Russia. Under Kevin Rhodes, the “Classical” work nearly reached full bloom. On a podium extending the reach of his long arms, Rhodes leaves one with the impression of outsizing this chamber orchestra. Though some directorial details were evident, still more coaxing of the finer points was wanted. First Baptist Church of Newton should become a destination point, given its central location, ease of parking, and its highly satisfying acoustics; it’s a most accommodating space for concert going.